When, in the small hours of the morning, still half-dreaming and walking with hesitant steps, you approach an ascent of the Grand Pic de la Meije, you begin to climb up a gentle stone couloir, without really seeing it, like a sleepwalker. Your wake-up call resounds a little higher: you stumble up against a steep wall that seems raised to halt the progress of any climbers. After all, that's what happened here on September 27, 1876. French alpinist Henry Duhamel and his Chamonix guides Francois Simond and Edouard Cupelin, stopped at around 3500 meters. They built a cairn to mark the point they'd attained, which came to be known as the Pyramide Duhamel. Born in Paris, Duhamel had moved to Gieres, close to Grenoble, after the death of his father. Duhamel had been a sickly adolescent, and his doctors prescribed a sojourn in the Alps. By age twenty, he had dedicated the rest of his life to the mountains. For the young alpinists of Grenoble, the nearby Massif du Haut-Dauphine seemed like a natural playground. Over there, they knew, rose an inaccessible peak: the Grand Pic de la Meije. Transfixed with desire, Duhamel had tried to climb it from the east ridge, the north-facing Corridors and the west ridge. In 1875, he and a teenaged nobleman, Emmanuel Boileau de Castelnau, had perched on the central peak of la Meije—a lower summit called the Doigt de Dieu that pointed toward the heavens like an authoritative finger. From there, Duhamel noticed one area on the south face where the angle appeared more moderate: the Arete du Promontoire. But he didn't have the audacity, yet, to push his advantage. A year later, Duhamel decided just to go and see what might happen, without really believing in success. He brought two ladders that could be stacked one on top of the other. But this wall clearly impressed him as much as it did his guides. They didn't even try to go farther. In La Meije, Reine de l'Oisans (2000), Pierre Chapoutot explains, "They failed because they decided they would fail!" After the attempt, Duhamel wrote to Adolphe Joanne, the president of the Club Alpin Francais (CAF): "I will permit myself to state with assurance, la Meije cannot be climbed." IN 1877 DUHAMEL was at the village of Vallouise, in a sunny open valley on the southeast side of the massif. The CAF had moved its annual meeting here for the inauguration of the Refuge Cezanne. That season, the conditions in the mountains were ideal for ascents—the skies were calm, the nights cool enough for frost—and the gentlemen of the club, in dress coats and ties, went from banquet to banquet, lecture to lecture, raising numerous toasts. At the time, there were only a few French alpinists, and they still weren't very bold. But after France's defeat in the Franco-Prussian War, they counted on raising the pride and morale of their nation through their feats, and they chose the Club motto: "For the Homeland, Through the Mountain." Duhamel was one of the founders. He felt at ease in this crowd, among people from his own social class, the upper bourgeoisie. His status as an explorer of la Meije bestowed a certain aura. He hadn't succeeded, but he'd gotten close, and here he was a celebrity. On August 18, Emmanuel Boileau de Castelnau burst into the midst of a banquet with his guide, Pierre Gaspard. Two days earlier, they had climbed the Grand Pic de la Meije, and they had come to proclaim the good news. The Club members welcomed them with fervor: it was the first time a French team had reached the top of a major, difficult unclimbed peak. (When local climbers summited Mont Blanc in 1786, it was not yet part of France.) It was a good omen for the future of the CAF, and la Meije would become its emblem. Without a doubt, Boileau de Castelnau and Gaspard's success was a blow for Duhamel—a lashing rebuttal to his peremptory, and imprudent, letter. He had spent so much of himself trying to attain this first ascent, and now when he heard their announcement, he said simply, "Ah! So it's done." He congratulated his rival and took part in the general euphoria. It was convenient that this high society gathering at Vallouise still had a good stockpile of champagne, which the revelers soon put to use. Duhamel would never again attempt his favorite summit. Instead, he contented himself with the first ascent of the Pic Gaspard, a satellite peak of la Meije, in 1878, with Gaspard and one of his sons. Two years later, once more with the Gaspards, he climbed a new route on the south face of the Barre des Ecrins. Even today, this route is one of the most beautiful excursions in the Alps: climbers step out onto the highest point of the massif amid the dazzling, reflected light of the northern glaciers. AND THEN, ONLY TWENTY-SEVEN, Duhamel turned away from serious, technical alpinism. Nonetheless, he stayed interested in the Haut-Dauphine. 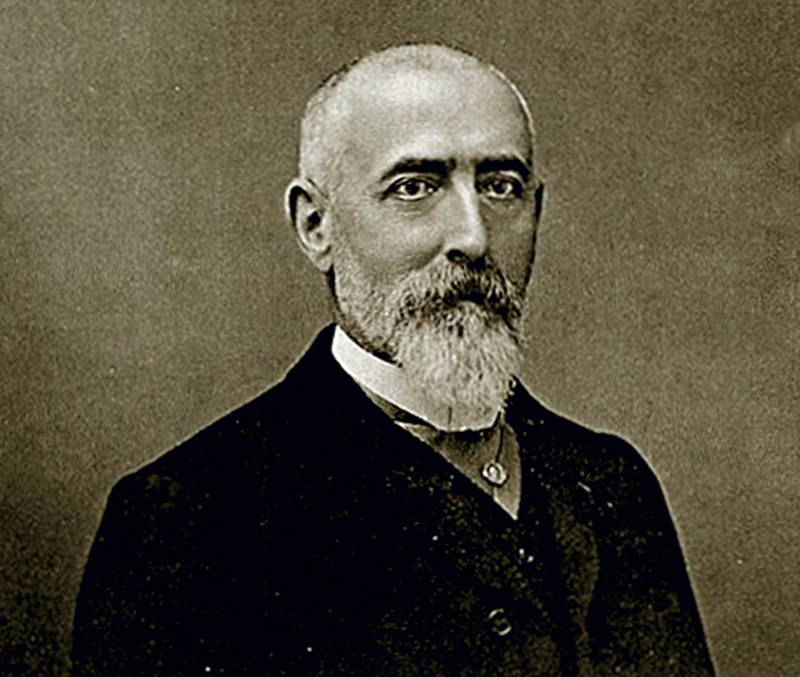 He created a map at a scale of 1:100,000, published in 1889 with the Guide du Haut-Dauphine, co-authored by W.A.B. Coolidge and F. Perrin. Colorful and decorative, the "Carte Duhamel" also included precise lines that made it an essential tool for alpinists—decades ahead of its time. Meanwhile, Duhamel had begun exploring the mountains near Grenoble in winter, and in 1878 he visited the Universal Exposition at Paris, where he hoped to find snowshoes. A Norwegian exhibitor showed him a pair of skis—equipment then unknown in France. Duhamel bought the display model. It took him ten years to perfect the bindings and to ski in a satisfactory manner. But he was more obstinate with this new sport than he had been with la Meije, and his dashing silhouette, armed with a single long pole, became a familiar image on the slopes of Chamrousse. In 1890 Duhamel brought back fourteen pairs of skis from Finland and created the first ski club in France. With a Swedish instructor, he organized a demonstration in the Vercors that generated a lot of buzz—so much so that in 1901, members of the 159th Alpine Infantry Regiment began learning to ski at Briancon. Loaded with their packs and rifles, their cartridge belts strapped over their shoulders, the soldiers glided down the long snowy valleys of the Haut-Dauphine—like transformed figures of the chamois hunters of old. At the start of World War I in 1914, Duhamel was a captain in the reserves, but he had passed the age limit. Nonetheless, he obtained a commission to train units of skiers in the 28th Battalion of Alpine Hunters. In December 1916, the great mountaineer slipped on some verglas in the courtyard of the barracks. After such a banal fall, he hid his pain. He died from the effects of the injuries at the beginning of 1917, at age sixty-four. These days, many of the skiers who hurtle down the slopes of the Haut-Dauphine aren't interested in the history of the pioneers. The "Carte Duhamel," its delicate tints a little faded, has been replaced by the anonymous IGN maps—or more often, now, by GPS. Even the cairn on the south face of la Meije hasn't survived the rigors of the mountain environment. The Pyramide Duhamel is only the name of a place where an attempt ended without glory. What remains of Duhamel? For those who remember, the image of a pleasant man—not particularly brilliant, a little plodding—whose influence on the history of alpinism remains a faint, but still luminous trace.